Peanut butter truffles have a chocolaty peanut butter flavor. 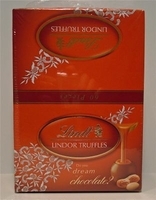 Lindt lindor truffles are gourmet candy. They are known for their melt in your mouth chocolates. Each box has 60 peanut butter truffles.